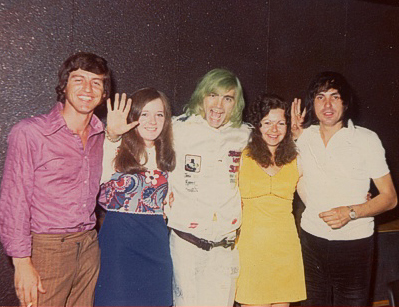 By 1972 Dave Sutch lived at Ronnie Long's house with his American girlfriend Thann Rendesy because his mother would not let them live together at her home. They lived there for about a year until they found a house in a place called "Petshill" which was just near Harrow. In the Summer of 1972, Dave Sutch asked Ronnie Harwood if he would reform The Savages with Pete Phillipps for “The London Rock and Roll Show”. 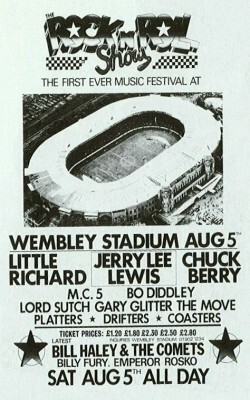 It was the first music show to be staged at the Wembley Empire Stadium on the 5th August 1972. The event gathered many Rock’n’Roll pioneers such as Bill Haley & the Comets, Jerry Lee Lewis, Chuck Berry, Little Richard, Bo Diddley, Joe Brown, Billy Fury and many others. A South Stand seat ticket costed just £2.80. The show, watched by a sell-out audience of 87,000 (the authorities restricted attendance for safety reasons), lasted 11 hours. Ronnie Harwood was now playing rhythm as well as keyboards and brought newcomer Sid Meadows in the band to play bass instead of him. The other band members on that day were Dutch guitar player, Alan Gascoigne on lead; and a saxophone player from Portsmouth called Bob. The roadie who played the part of the grave digger was Brian Magoo. He went on to work for ELP and The New Seekers. Not only Ronnie Long worked with them as their P/A at the Wembley Rock'n'Roll show but also played the parts in the show, grave digger, policeman etc. and he used to dress up as Alice Cooper in the 70's. The following day, Screaming Lord Sutch & The Savages were playing on the Isle of Man. This line up did not last for long because they could not rehearse together as they didn't live in the same area. Indeed as Ronnie Long recalls "Phillipps and Gascoigne both lived in Leicester, Meadows and Harwood were from the London area, and Bob the sax player lived in Portsmouth so it was impossible to rehearse, except if they managed to get to the gig early! which was not a strong point with Dave as it was a job to get him out of the house and into the van which I had the job of doing quite often." So Screaming Lord Sutch had to use "Rock Rebellion" once again. Nevertheless, when they finished with Sutch, Gascoigne, Meadows, Phillipps and Harwood stayed together as "The Original Savages". In January 1975, they performed at The Old Spotted Dog in Neasden, NW London, with a new drummer: Ricky Winters, formerly with Cliff Bennett and the Saints. Ronnie Harwood then became a prolific producer and songwriter: he produced Johnny Red's albums and composed “You Drive Me Crazy” for Shakin' Stevens., an huge hit in 1981. He won the IVOR NOVELLO AWARD BASCA,MOST PERFORMED WORK,for this song.